G Brown Design, Inc. is providing master planning and phase 1 design services to Salt Lake County for the development of a 30-acre community park in Riverton, Utah. 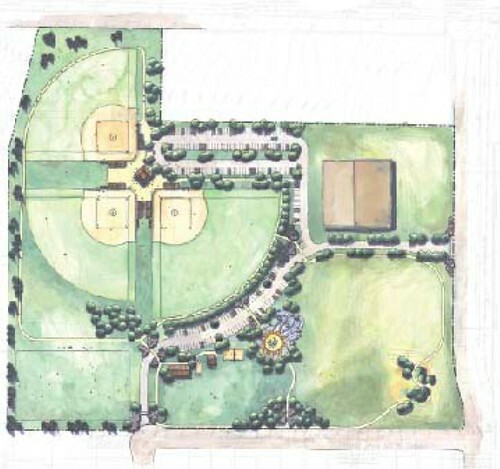 The master plan includes a future recreation center; fields for softball, soccer and football; informal grass play fields; a picnic pavilion with nearby volleyball and horseshoes; and a playground with a zero-depth water-play feature. GBD designed the 7-acre retention basin on the site as a naturalistic pond. Storm water from the adjacent subdivision will bubble up and flow through a meandering wetland that will help clean and filter the water before it enters the pond. A trail through the wetland will allow park patrons to use the area for activities such as bird watching, strolling, running, and walking dogs.